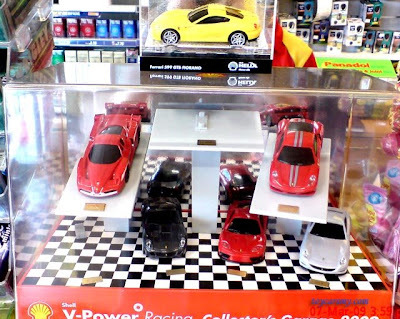 Started from 3rd this month, Shell returned with the Shell Ferrari models produced by Hot Wheels. This is the 3rd series specially made for Shell in a row with end only 11 May. I have to drive hard to empty my tank filled up a day before the promotion was announced. Only until today managed to get my 1st Shell Ferrari with touch steering. As similar to the 1st 2 years promotion, customers with refilled above RM40.00 will entitle to get the models at RM6.90 for V-Power, RM8.90 for Super or Diesel. Not all the models are available on first period of promotion. At present, only 430 Scuderia, FXX Evoluzione, 599 GTB Fiorano, 612 Scaglietti, and 360 GTC are available for your selection. Limited Edition 2008 F1 Ferrari model and Ferrari ENZO model with Dual Speed pullback only after 17th March. Helix Engine old customers are entitled to purchase one yellow Ferrari 599 GTB Fiorano model with Dynamic Engine Sound and one Ferrari 430 Scuderia model with Touch Steering with purchases of Shell Helix engine oil for, RM6.90 with purchases of Helix Ultra, HX7 or HX7 Diesel and RM8.90 with purchases of Helix HX5. Together with the launch of the limited edition models, the 2009 Collector Garage and Playmat will also available for purchase. 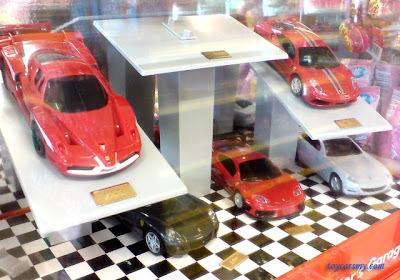 The Garage is larger and nicer this year with the same price of RM60.00, 3 layers arrangement to showcase your beloved Ferrari. Conversely, I have no details on the playmat for its selling price. 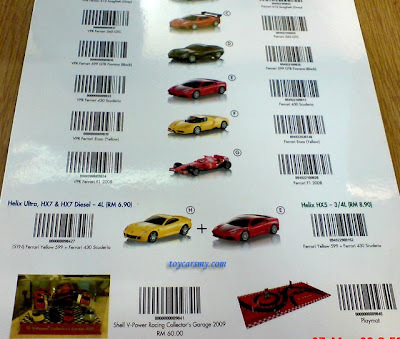 See picture below, the playmat just excellent to play with your Ferrari cars with the touch steering function. There is a Start and Finish line to race your Ferrari with 2 pam stations as barricade, you need to program it to drive "safely" toward the finish line. I really did not expect of the release of the Ferrari models after the James Bond promotion. The Shell Ferrari cars are something we should looking forward every year from Shell. As collector from 1st two series, I can't find any good reasons to skip it the series this year. When the promotion ended, you will find yourself regret. The garage is something must have to complete and showcase the collection, you can't find any display case better than the original with the price of RM60.00 (Share with me if you found it). Or just the garage w/o the cars? I asked a few Shell station (that sold the garage before (edition 1 & 2)on the availabity of the garage. They mentioned that it will only be on sale from 17th March 20009 onwards in conjuction of the Sepang F1. Can any of you guys comment on this? Is it true? I noticed on one of the photo, there is a special casing for 599 GTB (yellow), does it comes with the garage or there is a space for the GTB in the garage itself? If there's a space in the garage, how to fit in the Enzo Ferrari coz there are 8 cars in total! Just like the 2nd edition where i cant put my yellow Enzo in the garage. Hope you guys can enlighten me on this. Thanks. The garage can fit only 7 cars. Same the yellow 599 GTB isn't have a parking lot in the garage. Is the same Scuderia for both Helix and Vpower. Enzo and F1 cars likely will be postponed to 24/3. Lastly, 1st batch stock finished, leave only F430 Scuderia and the 612 Scaglietti. Thanks for the latest info. I hope they can give the special casing (shown on the first photo)for the yellow GTB. I cant wait for the roadshow at the Curve from 27th - 29th March. Shell V-Power Racing Playmat is available for sale at RM15 or redeemable at 1500 BonusLink Points. Just got the F2008 car today. I finally completed this year's collection. Phewww.. But yet to buy the Garage and racing playmat. I went to the gas station today but the owner informed me he yet to get the stock. I didnt buy the yellow Enzo Ferrari though as I bought two last year.